The Routledge International Handbook of Innovation Education is the international reference work on innovation education and potentially opens an entirely new direction in education. The overall goal of the handbook is to address the question of how to develop innovators in general and how to develop the innovative potential of today's young people with exceptional talents in science, technology, engineering, and maths (STEM) disciplines in particular. Today many governments around the world are interested in the development of STEM innovators. This handbook provides the first and most comprehensive account available of what should be done in order to develop innovators and how to do it successfully. It includes chapters by leading specialists from around the world responsible for much of the current research in the fields of innovation, gifted education, scientific talent, science education, and high ability studies. Based on the latest research findings and expert opinion, this book goes beyond mere anecdotes to consider what science can tell us about the development of innovators. 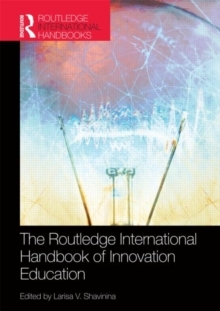 By enlisting chapters from innovation experts, educators, psychologists, policy makers, and researchers in the field of management The Routledge International Handbook of Innovation Education will allow all of these scholars to speak to each other about how to develop innovators via innovation education, including such issues as:the nature of innovation education, its basis, main components and content, its criteria and specificity in various domains and contexts, societal demands placed upon it.